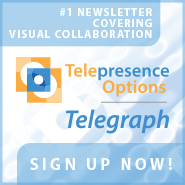 Sign up for the FREE Telepresence Options Telegraph, our monthly newsletter following the latest in visual collaboration news and events. 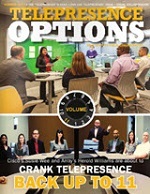 Subscribe for FREE to the�Telepresence Options Magazine and Catalog, our annual print publications. LinkedIn: Telepresence Industry Professionals (TIP) is our industry association on LinkedIn, and is now over�4,200+ members! The group is a superb venue for discussion, networking, and industry news and information. Twitter:�Our content is syndicated to our growing list of over�3,800+ Twitter followers. Facebook: You can "Like" us on Facebook and join our growing list of friends and followers. YouTube: Our video library on YouTube has generated over 100,000+ views of visual collaboration related content. RSS: TPO Main Feed: The one that made us famous. The most important visual collaboration "News You Can Use" including: Original reporting and journalism, new product launches, CXO Level Interviews, and more. RSS: TPO News Stories: A compilation of business, academic, and popular articles on telepresence edited and occasionally photo illustrated by the editors. RSS: TPO Press Releases: Want to stay up-to-date on an industry moving both figuratively and literally at the speed of light? Get the most important press releases of interest to the telepresence, videoconferencing and visual collaboration industries. RSS: Telepresence Robotics: A compilation of articles reporting the latest in Telepresence Robotics. RSS: WebRTC: Stay up-to-date in WebRTC news. Get the most important articles of interest to the WebRTC industries. Issue: We publish a number of resources, including Telepresence Options Magazine on the Issuu platform which both produces high-quality digital editions for readers on computers and iPads and exposes the publication to Issuu's 52 million monthly readers.